As someone who has occasionally ventured outside my filter bubble of left-wing, educated, literate and caring people: this still shocked the hell out of me. Diane Abbott may have just given us all the opportunity to see what happens when your health becomes an issue, in stressful situations; something usually hidden away. I’ve had health issues that have held me back, blighted my life and generally fucked it all up for me on many occasions. I am now grateful I wasn’t in any sort of public position on those occasions. Thank you for everything you have done for this country Diane Abbott (and thank you Jack Monroe for pointing this out), and that includes showing your vulnerability to a pack of rabid, ignorant, click-happy shits. I think you are the stronger for it. Please read Jack’s post and share the hell out of it, because it matters. Substance and hard work over knee-jerk, prejudiced awfulness. It doesn’t matter who you are voting for today (well, obviously it does, a lot, but, ykwim) this bargain basement level of non-thinking demeans us all. Fight it with facts. Cyclists – the answer to the question “What shall I wear to ride today?” is HIGH VIS. It’s always high vis. I’ve been a cycling commuter in the past, I live in a city where that is entirely the best option for local travel, but now I drive. Because I work 30 miles away from home. So I know that “cyclists” are not a homogeneous group and neither are drivers. As a regular cyclist, I wore a helmet, had lights, front and rear, the usual reflector on the wheels that bikes come with, a coat with a reflective strip and, when I remembered, a Sam Browne. However, I saw many cyclists who wore some or none of those, I saw one knocked off his bike as he was using his phone and called an ambulance for him, I saw drunk cyclists, pavement cyclists, red light runners and many, many safe and considerate cyclists too. What I wouldn’t wear is black lycra, or if I did I’d then put lots of high vis over the top of it. And that goes for runners too. We’re all road users and have responsibilities as such. Mine as a driver is to drive attentively, safely, with a roadworthy vehicle, within the law and following the Highway Code. The same advice pertains for motorcyclists, all road users in fact. I know that a lot of drivers perform dangerous overtakes, pass far too close to cyclists who may be further out in the road than some drivers think they should be due to the high levels of skiddy, tyre-puncturing crap that collects in the gutters (not to mention potholes and drain covers). I know that a lot of cyclists do wear high vis, in all weathers at all times of day. I see those cyclists far earlier than the black lycra lot, so I know to expect oncoming traffic over the central lines one way or another; I can take action to pass them safely or to allow others to pass safely. But I am terrified of the “serious” cyclists I see, out solo or in pairs, on high end road bikes, training day in day out for road races, incredibly fit cyclists taking on hills that knacker me just looking at them. Good on them, keeping fit and healthy. Taking their exercise very seriously. But why don’t they take their safety seriously? Even white cycling tops aren’t bright enough, it has to be high vis, it just has to be. I feel like I’m doing what I can to keep these cyclists safe, but they’re not doing all they can. There is evidence that some pedestrians over-estimate their ability to be seen (Interventions for increasing pedestrian and cyclist visibility for the prevention of death and injuries from the Cochrane Injuries Group (2006) ) and perhaps the same is true of cyclists. Why take that risk? If one of my nearest and dearest, or even a casual acquaintance, was a cyclist and I knew they went out in dawn or dusk, in dark clothing, in Winter and on roads that other people use, for driving on for instance, I’d have some strong words. I’ve seen so many examples of this; bloody fit people with calf muscles like taut ropes but with no attempt made to make themselves visible to other road users. I really think whatever fashion or fabric performance issues these cyclists have with high vis, I’m sure they’d look far worse in traction, or the wrong way up in a hedge, or smeared all over the road. And I’m sure their family would agree. So, sort yourselves out. HIGH VISIBLITY CLOTHING; get it and wear it. Before you ruin everyone’s day. Not on holiday, although I will prioritise my enduring need to paddle in the sea, but to a conference. Lucky, lucky me won the Briggs-Washington Bursary so generously awarded by the Commercial, Legal & Scientific Information Group (CLSIG) of CILIP; the only way I could possibly afford to go to this conference. This is my first conference where I have a clear direction, however. Previously I’ve been in a holding pattern, waiting to get my first proper job and seeing which way my career is going to go and as a result going to every possible lecture on every aspect of librarianship to cover all eventualities. Hooray for some direction. This is the first time I’ve been able to peruse a programme and know instantly which strands and which lectures will be the most relevant and useful to me. Managing Information is the most pertinent strand for me and I’m looking forward to hearing from the best and the brightest about current thinking in knowledge and information management and hearing about some case studies – especially the Systematising Shakespeare lecture just because of the subject matter as much as anything! I’m also keen to make the most of the Your Career strand as it’s high time I registered and got started on my chartership journey (having children really does make it a long slower to achieve career goals in my experience). There is one really tough call on this programme, and I wonder how @ninfield feels about going up against Chris Riddell in the schedule? Fiona Green, the Head of Public Enquiries, explained how well-used they are as a service, fielding enquiries from the public, individuals and campaign groups, law firms and schools. They are concentrating on outreach work to reach new audiences, starting with a project in public libraries last year asking them to display a poster in the library, tweet a picture of it on display and monitor if it drives traffic to the website. This will be done on a larger scale during Parliament Week this year, 14-20 November 2016. They are well-written and a great starting point for learning about Parliament. I have a set that I may well foist on my children’s school during Parliament Week! Parliament’s Education Service also produce some smashing resources and run visits and workshops http://www.parliament.uk/education/. The videos on this website are short and informative. And someone has done some very nice work on the UK Parliament Facebook page, it has the lengthiest timeline of any page I’ve seen, going back to 1215 (Magna Carta, not lunchtime). Last to speak was John Prince, Historical Sources Specialist, who encouraged us to go and take a turn around the exhibition containing many interesting sources, including one of my favourites: the London Illustrated Times. The articles, illustrations and advertisements are a great way to lose yourself in history. He also told us that Hilary Saunders, the librarian from 1945-1950, was also the author of many spy stories and wrote the story that was made into the Hitchcock film: Spellbound. There was a nice film on the BBC website recently where John Prince takes a journalist on a tour of the library; so you could have just watched that and not bothered to read my efforts. If you watch the video you will get a flavour of the tour we took; this included such snippets as the most popular books borrowed by MPs, a look at the record of Parliamentary proceedings that included the discovery of gunpowder in the cellars in 1605 and the delightful discovery that there are many works of poetry on the shelves. Amongst the popular periodicals in the foyer of the library, along with Private Eye, The Spectator and New Statesman I was very pleased to see the Which? magazine. As we took the tour, we had a weather eye on completing a 20 item quiz we’d been given with the entreaty not to use Google. Whilst I was not too pleased with my score of 10 out of 20, I was comfortably ranking along with the majority, and in the company of information professionals I wasn’t unhappy with that. The newly-formed Research Information Service sits within the Research Directorate and supports the work of the subject specialists with current awareness services; indexing and tagging core material; producing bibliographic information (reading lists etc); resources training and support. This service was formed in April 2015 and works with approach that all library users are customers with different and changing information needs. Throughout these staffing structure changes the library has also had to cope with being housed in a Grade 1 listed building that urgently needs extensive restoration. Options are being explored for moving out of the palace to allow restoration work to commence. A lot of the reserve collection is housed in the cellars of the palace, 2.5km of shelving in fact. Access to this and the logistics of moving it are tricky, Julia Keddie (Collection Management Coordinator) showed us photos of steep, narrow staircases with 180° bends. Similarly problem-bound are the archives department; they are located in Victoria Tower which is at the opposite end of the building to Elizabeth Tower which houses Big Ben. They have one cramped lift and 8.5km of collections to move. The archives is a shared service of the Commons and the Lords, it is not part of the library. The plans to move the archives will tackle many of the problems they currently have: poor workflow and space provision; severely limited public access and facilities; inability to control access to the repository; and the attendant issues associated with disaster recovery planning and salvage. If the archives vacate the tower it will release 7% of the palace, coveted space in an overcrowded building! Having spent a lot of time in metadata, these are the kind of gems that I love: Liz Marley, the thesaurus editor in the Indexing and Data Management Section, had a few words to say about parliamentary language being precise and loaded and the key issues of context, the politics of naming things and occasionally getting it wrong. An example of the latter was highlighted when representatives of the Bahá’í religion objected to a parliamentary indexing term referring to them as the ” Bahá’í sect”; after some discussion this was then changed to ” Bahá’í faith”. This is an example of the power of words and the need to get them right. The names of countries can be politically sensitive too: whilst the UN refers to Myanmar, the UK refers to Burma as it does not recognise the legitimacy of the regime that changed the name in 1989. The Independent Commission on Information Retrieval caused some head scratching as to how to index. In and of itself it gives no meaningful clues as to what the work of the commission involves. Research revealed that this is actually the commission to find where all the bodies are buried in Northern Ireland, to try to lay the legacy of The Troubles to rest. And finally to Islamic State / ISIS / ISIL / Daesh / Islamic State Group. How are they to be indexed? The BBC have stuck to “so-called Islamic State” whilst David Cameron has recently referred to them as Daesh. The parliamentary thesaurus has all terms linked however, so a search for one will return all relevant results. Finally Liz Marley introduced us to Search parliamentary material This is a new federated search tool currently in beta which could be a very useful one-stop shop for all research on legislation and UK regulatory affairs. Have a play and see what you can find. The House of Commons Library employs around 70 subject specialists to prepare briefing papers, research enquiries and provide confidential and impartial information for Members of Parliament. It consists of 4 reading rooms that neighbour The Speaker’s apartments, a reference desk that is within jogging distance of the chamber and extensive collections of hard copy, digital collections and enviable access to online resources. And it really does look like this. It is an environment conducive to study, not least because the MP’s staff are not permitted access and so cannot interrupt. It must be said that those chairs on the left are very comfortable and are more conducive to sleep than anything else. and many, many more. These guides are written to give MPs the background to a subject that is about to be debated; but they are a great place to get background information on many subjects. They have been produced by a very well-resourced and skilled information service. Other elements of the library’s role include public engagement and outreach, curation of heritage and indexing Hansard. 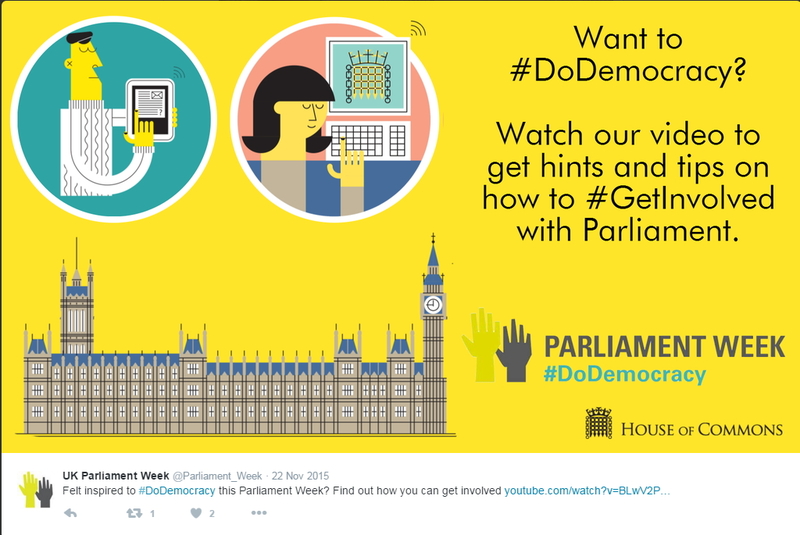 Their work is used for parliamentary debates; scrutinising and informing legislation; media, e.g. Question Time; constituency surgeries, specialist interests and Select Committee work. There is a still a high demand for hardcopy, especially newspapers and periodicals. Some MPs will use more digital resources than others, no different to any other library’s patrons. In staffing structure structure the closest comparison I can make is with an academic library even to the extent that they have recently restructured (2014) and have a customer service approach to MPs now. They changed the physical layout of the library, underwent behavioural training and a Continuous Improvement programme. I recently attended a Continuous Improvement talk at the University of York where they talked about how they achieved Customer Service Excellence, a government initiative in fact, and this restructure put me very much in mind of that. I work as a paraprofessional indexer at the British Library in Boston Spa. I enjoy my work and actively participate in wider professional activities too. So when the opportunity arose to attend Umbrella through the very kind sponsorship of the CILIP Affiliates Network, with help from The British Library, I didn’t need to be asked twice. It was an event I’ve always wanted to go to but could never afford. And what an event it was. My head is still abuzz with the huge amount of information that was delivered in the sessions. 2. the challenges presented by the economic crisis, which results in a crisis for libraries across Europe. For example, he pointed out that South Korea as a burgeoning society is opening 180 new libraries this year whilst the UK are trying to close 400. It struck me throughout this address that we often lack a wider perspective from our little island. As Gerald talked us through the differences between the European Union and the Council of Europe, and what the legal implications were for a common library policy, I felt he had uncovered a huge gap in my knowledge of what happens in the rest of Europe; Personally I’m probably far more aware of US and Canadian libraries than European. The PISA report of 2009 identified Finland as having the highest levels of literacy due, he told us, to them having the best library system in Europe. The lowest levels of attainment were found in Romania. Approximately 20% of young people there are at risk from all that follows from poor literacy as they cannot be reached by the written word. Gerald concluded that libraries make an important contribution to a country’s culture, education and knowledge, and that they are part of civic responsibility and vision. Herr Dr. Leitner also pointed out something that resonated across the advocacy strand of the conference: that the press and politicians, like anyone else, hold preconceptions and prejudices about libraries and librarians; the difference being that they, rightly or wrongly, have the power to influence. What has been tremendously heartening has been the formation of Voices for the Library(VftL), represented here by the very impressive and seemingly endlessly energetic, Lauren Smith and the ever-entertaining and informative CILIP Vice-President Phil Bradley. VftL has been moving mountains in addressing those prejudices and when you hear the passion with which everyone at Umbrella speaks about the LIS sector it starts to feel like a fight we can win. We can show everyone our worth. Tuesday was a long day, but too exciting and interesting to let tiredness get in the way of more experiences. I’d started the day at 5am to travel from York to Hatfield, but I was glad I’d made the effort to dress up and head out to the gala dinner because it was a chance to hear Bonnie Greer speak. She opened with the news that MPs were going to vote overwhelmingly to refuse Rupert Murdoch’s bid to buy BSkyB thus thwarting his monopoly over information flow in this country. This was met with rapturous applause and has pinned the moment to my memory of the conference, something I’ll always remember. Bonnie spoke about free access to information and the written word with great passion, we were all entranced by this impressive, charismatic and erudite woman who made us all very proud of the work we do. Over the two days I listened to presentations from academic, public, government, museum and other special libraries. I learned about working with digital, hard copy, photographic and digitised collections. I heard from non-professionals, paraprofessionals, newly-qualified librarians and very experienced specialists. I can’t see where else you would have the opportunity to experience the breadth of this profession, be inspired, motivated, confused, captivated and moved to tears in the space of just two days. The tears came with the ‘Libraries Change Lives’ award that was won by Kent Libraries ‘Making a Difference’ project, although all three finalists deserved recognition for their wonderful work. Some of what I heard was familiar to me, but much of it was outside my sphere of experience and I’ve had a chance to learn about information work across the sectors which has broadened my horizons considerably. I came away from the conference with a feeling of pride to belong to such a respected and august institution: as soon as anyone looked at my name badge and saw The British Library they were immediately impressed. Similarly when touring the exhibitors’ stands, as soon as the vendors saw I was BL they immediately switched off their hard-sell, from the SWETS representative to a vendor that specialises in outsourcing cataloguing and authority control; the latter because we’re already good customers of theirs, the latter because she knew that we do much of our metadata work in-house. It seemed to me that a lot of librarians look to The British Library to lead on best practice, especially those who work in small teams or as solo librarians who rely on our metadata in order to catalogue their own collections (this is certainly something I did when working at the National Railway Museum). Looking back over my copious notes from each session, initially I’ve hit information overload. But as I begin to digest and reflect on what I’ve heard, start to investigate online resources, and make contact with people I met, I feel confident that I have chosen the right profession; I really love the challenge of using the skills, the collections and the technologies to make a difference in people’s lives and I look forward to a long and interesting career. Helped along the way by all the free pens I got from the exhibitors! This week I have been reading a lot about social policy, for a specific reason but actually it’s tuned me in to stuff on t’Internet beyond what I normally read and that’s a good thing. For a librarian to only read library stuff is not so good. In fact, bearing in mind what Prof Blaise Cronin said to us last week at the LIS_DREaM conference it’s vital to know our place in the wider world. When East Coast deigned to allow us to arrive at Kings Cross, Simon Barron and I hotfooted it round the corner to The British Library conference centre just in time for Hazel Hall to get started; (was there ever a better way to let people know you’re running late than tweeting that fact with the conference hash tag?) This conference was the beginning of a project whose noble aim is to develop a nationwide network of top quality LIS researchers. Prof Cronin got things off to a good start with a nicely provocative keynote, part of which was some fairly robust criticism of current LIS research and that’s what I’d like to think about here. One of my fears about my MA research was that I was just taking a snapshot of public libraries’ online activity and that it’d be out of date instantly and therefore pointless. That it was just me prodding around online looking at library websites and and scribbling something down to fulfill my degree requirements. From my experience of being related to PhD researchers, once being married to one and having loads of friends doing one, it seems to me that a healthy feeling of fear is pretty much a constant for researchers. Sometimes it’s a good thing: it keeps you keen, relevant and scrupulous in your reading and current awareness. Sometimes it pushes you over into generalised anxiety, sleeplessness and misery. But underlying all of that you hope against hope that it has some point, that you’re putting yourself through the mill for The Greater Good. Well Prof Cronin has called us all on that one and pointed out how some LIS research is ivory tower, narcissistic twaddle. Stuff that gets published and keeps the researcher in academia but contributes nothing to the canon. That’s what I was worried about and I’m glad it’s been voiced because it leads on to something that Prof Nigel Ford said just the week before at Umbrella: that research and practice need to be a lot closer to one another. Prof Ford’s lecture was called “Technology, Personalisation and Librarians: Research & Practice”. Nigel’s lectures are always entertaining and I wasn’t going to miss the opportunity to relive my MA days so went along to hear him speak. The thrust of his opening was that we can leverage the different information needs and information processing styles to provide personalised information services, this personalisation is the way we do our jobs in future, it’s how we prove out worth. But in order to do this we need far more interplay between LIS researchers and practitioners. So when Prof Cronin called for meaningful and rigorous research I immediately doubted my own efforts. However, when I’ve reflected I think I’ve managed to convince myself that my snapshot was useful. I had a huge response to my initial questionnaire, so much so that I had to scale back what I could achieve with the data. So, practitioners who I surveyed clearly cared about what I was asking. There were some very strong feelings expressed. One of my initial hopes was that in casting my net to capture UK public libraries’ participation in Web 2.0 I would be creating a list, a resource, that others who wanted inspiration could turn to. I think I achieved that in some measure. I think that because after I published that research on my blog last year, I immediately got asked to write a guest blog post for UKOLN Cultural Heritage Blog, off the back of that I was asked to write an article for Ariadne magazine. I was asked to speak at a Oxford University Press Panel Day on Discoverability for Public Libraries. I wrote an article for CILIP’s MmIT group newsletter and have just had another article published in CILIP’s ISG group journal, Refer. So I’m thinking that people did give a damn about what I wrote, what I found and what I was able to point them towards. I think I’m pretty much done with it now, it’s ancient history really and I can’t sustain follow-on research (see my Chaos postings for why not! ), plus I want to move on to whatever’s next now. So all that meandering has led me to draw a line under my MA research, it’s time to move on. But I look back on it fondly, it got me some great opportunities and I think I’ve decided that it was good, solid research that did fulfill my ambition to be of actual use to practitioners. further to my earlier 2 posts I would like to add that I don’t think I’m particularly different in the demands of my life, I just think I could be a whole lot better at organising myself. I’ve been meaning to rearrange my kitchen cupboards for over a year now, every time I open one door, a cascade of tupperware falls onto the floor; I’m determined there’s an ergonomically-pleasing way to store storage but I’ve never given myself the time to work it out. And just in case anyone wonders how it’s possible to write a master’s dissertation with a 7 month-old baby, I attach a photo in explanation. And now it’s time to relax for a couple of hours, safe in the knowledge that I have blogged today, although not impressively or meaningfully, but I can tick that box. Collating and presenting results from Excel, nourishing my mind whilst nourishing my child.